There’s so much meaning and value I want to foster in my present life, and yet a tragic past continues to drag me down. I feel like I have weights tied to my ankles. It’s the heaviness of grief that still sneaks up on me. Truly, I’ve been through a lot – the toughest and most heartbreaking of which was losing my husband in a car accident when he was only 35-years-old. And right now, six years later, I’m at a point where I’m trying to make the best of a bad situation, but I wake up on some mornings and just can’t seem to let go of the way things were “supposed to be” in my life. Anyway, I know you can’t solve all my problems, but I was hoping you could shine some light on my situation. I could use a little perspective today. Do you have any wisdom you could share? Angel and I just finished reading your email, together, and we sincerely wish we could start by giving you two of the biggest, longest hugs imaginable. But since that’s not possible at this very moment, let me tell you about an unexpected phone call I received in the middle of the night last night. My phone rang just before midnight. I didn’t answer. Then it rang again a minute later. I rolled over, grabbed it off the nightstand, and squinted at its bright, glowing screen. “Claire,” it read. Claire is a close friend – a friend who tragically lost her husband to cancer last year. And I figured since she rarely calls me in the middle of the night, it was probably important. “Hey, Claire. Is everything OK?” I asked. “And you’re still on your feet right now,” I added. “What’s the saying?” I asked. “Do your best with what’s in front of you and leave the rest to the powers above you,” she replied. I smiled. Because I love pieces of inspirational prose that help people progress through even the hardest of times. And because it suddenly reminded me of a short story my grandmother told me when I was a kid – one that’s also applicable to Claire’s circumstances. “A few days later… well, you can guess how the story continues,” I said. Claire chuckled softly and said, “Thank you.” Because the moral of the story was immediately clear to her. We just don’t know – we never do. Life is an unpredictable phenomenon. No matter how good or bad things seem right now, we can never be 100% certain what will happen next. And this actually lifts a huge weight off of our shoulders. Because it means that regardless of what’s happening to us right now – good, bad or indifferent, it’s all just part of the phenomenon we call “life” – which flows like the river in my grandmother’s story, unpredictably from one occurrence to the next. And the smartest choice we can make is to swim with the flow of the river. On most days, Claire does just that, and she does so with grace. She is such an incredible human being – a beacon of hope! And as Angel and I read your email together, it became quite clear to us that YOU and Claire have a lot in common. Truth be told, the wisest, most loving, and well-rounded people Angel and I have ever met are undoubtedly those who have known misery, known defeat, known the heartbreak of losing something or someone they loved, and have found their way out of the depths of their own despair by making the best of bad situations. These people have experienced many ups and downs, and have gained an appreciation, a sensitivity, and an understanding of life that fills them with compassion, kindness, and a deep loving wisdom. People like this aren’t born – they develop slowly over the course of time. We feel blessed to have worked with hundreds of these incredible people over the past decade, both online and offline, through our Getting Back to Happy course and coaching. In many cases they came to us feeling stuck and lost, unaware of their own brilliance, blind to the fact that their struggles have strengthened them and given them an upper hand in this crazy world. YOU are one of these people. YOU are so incredibly strong and brilliant. YOU are a light that shines brighter than you know. Thank YOU for being a beacon of hope in our lives. What has helped YOU make the best of a bad situation? Thank you for this open letter, Marc and Angel. It’s a beautiful response to the kind of struggles so many of us go through on a daily basis. When times are tough and I’m trying to make the best of a bad situation, or when I’m desperately struggling to make the slightest bit progress on a goal of mine, my #1 strategy is to consciously tell myself, “You are OK. Stop worrying and complaining.” Then I simply do the best I can with what’s in front of me, one small step at a time, just as you’ve said. Although there were many, this is probably the most life-changing tips I’ve implemented from your course and coaching – it’s a really a strategy I have ritualized into my life and use almost every day. This was indeed a beautiful response to an amazing woman. I can surely relate. Three years ago, when my husband of 30 years chose to abandon our marriage and move in with a younger woman, and I was simultaneously slapped with the reality that the courts don’t care about infidelity, I felt broken to pieces in more ways than one. But I was determined this hardship was not going to break me, and knew getting back to my faith and core principles would be my strength. This was when I found your blog and book, and devoured these two incredible resources. I’m happy to away I’ve pieced much of my life back together in a relatively short time. Of course, some days are still difficult for me, but I put one foot in front of the other, no matter what. And I force a smile every morning, even when it’s tough, because it makes me feel better. Thank you fellow Marc & Angel lover, for your comment. I so look forward to their emails, as I’m sure each of you do also. My struggles begin each morning when my eyes open, as I welcome sleep each night as it seems to be the only peace I have. Thank you for emailing me this article today. It seems like serendipity, because I really needed it. And I agree with Gloria and Steph, this post is a great one! Incredibly needed by so many. Lately I have been thinking exactly like your struggling student in many ways, as I’m going through a troubling period in both my personal and business life where nothing seems to be going as planned. My wife and I are working through counseling, but she’s leaning toward divorce. And at the same time my business is struggling due to the loss of a major flagship contract. I’ve been feeling broken down almost every day for the last few weeks. The vast divide between where I am presently in my life and where I want to be is tearing me up inside. But articles like this give me hope and help push me onward a little bit each day. Thank you. I thought nothing was going as planned as well…yet after a WAVE OF EMOTION appeared to overtake me ….I needed to change the plan…. or maybe have no plan at all and do the best I can so that the outcome will unfold with having good intentions put into action… one thing leads to another… I began to ruminate over the ” challenging issues”…. I reached out to Marc and Angel and read the comments of so many others…. the value of faith and this “community” and shared support assists in my ability to recognize the concerns of other people helping me to ….. have the courage to shift my ‘MOTIVATION’ from the negative energy of the situation to an energy of gratefulness and focus on being content with so many blessings already experienced in my life…. why do I focus less on that and more on challenges??? I now see this as another opportunity for growth… so instead of battling waves I can wade through them into calmer waters and keep my head above the water…. less struggle and go with the flow…..so I can be prepared when harder days come .. with a greater sense of … ability to experience the good within the challenge… and from reading all your comments know .. realize in some way this is all a part of life and I am where I am now as a result of every experience … where I am now is better so I would not change anything otherwise I wouldn’t be me and would not have these “challenges ” presented to grow from…. day after day really does get better and better even when overcome by “waves of emotion” at times… “I am a better swimmer now” ….I keep in perspective the challenges people have with life and death and my issue certainly is not that yet on a scale of 1 to 10 it can be very annoying….. leading a path to a more calm and grateful life preparing for better days and knowing how to face each “wave of emotion” with greater awareness and ability to cope. I know for me one of the big things has been keeping my head down and pushing forward with the idea that it is only temporary. While admittedly I enjoy the highs a little more than your fisherman, I try to look past the lows, because it only rains for so long before the sun shines again. Like your friend who called too, I find great solace in others. Spending time with friends is almost always a sure fire way to pick up my spirits. It’s incredible how at same time I read this letter..actually in the morning I was telling my husband that we don’t control situations in our life but can always control our reactions n perspective s towards it..to make the best of situation we r in..we all at some point or other goes through bad situations in life but should never ever loose hope and should always be prepared what ever fate has in store for us..each n every morning brings lots of love, energy n hope..its our turn to shine..
What has helped me make the best of a bad situation? Well, my faith, my family and remembering that I’ve been through so much already and I am still in the game. My Savior has been careful to protect my mind through all of my hills and valleys in life. So, I am prayerful (which is a dialogue between He and me – not this formal stuff that others talk about). M and A, sometimes I get downright ugly and sometimes I roll my eyes and some more. I can come to my Savior and I don’t have to be pretty or made-up. I also look at what someone else would say about my situation (sometimes seeking the counsel of these positive people in my life). For some reason, when someone else looks at your situation, it doesn’t seem as bad to them – which helps me remember that it’s temporary and I just gotta hold on a little while longer. I also exercise. I like to plan my workout routine in advance but if my day is going a certain way, I may not be in the “yoga” mood….I might need to kickbox and kick some tail! 😂 Some situations require me to take action so there are things on which I go head first. If it’s financial, I am very honest with myself and my husband about what we can and cannot do and the conversation is not always filled with smiles. But it is honest. Same thing when it comes to disagreements in our relationship. I try to pay attention and watch the signs of things that might be getting ready to “need attention” in my life and address them before they get out of hand. Last, I journal to get my feelings out in the air. Sometimes you may feel like no one is able to listen to your heart, so you journal to relieve anxiety and depression that can truly cripple you and keep you from moving forward. When I journal, though, one thing I do consciously is make an honest, honest, HONEST effort to be positive in my entries and make them as long as I would like. I’m real but honest. The reason is that there is always positivity in any challenging situation and that’s what I choose to remember. When I look back on those entries, I remember what bothered me at the time but I am so proud of my focus in the midst of it all. Gratitude goes a long way….no matter what. What keeps me moving even at hard times are these words that I, myself told my late Father at the time he was terribly ill on a hospital be (he had lost all hopes of survival and believed that was his final momemnts). Approximately a year ago, I found your blog. I read it everyday. It has helped put my life in a better perspective. Though I can’t see the light at the end of the tunnel at times, I re-read and read some more. Knowing that I’m not alone in the struggle helps. Thanks Marc, Angel .. everyone! “There is nothing either good or bad, but thinking makes it so” Shakespeare. “We have come too far to not go further, we have done too much to not do more” Whakatauki, Te Ika a Maui. “Content, then presentation” My Dad. “Have a drink of water and go for a walk” My Mum. I loved your quotes. Thanks for sharing. Actually your mom was onto something. When I lost my new husband to cancer it was recommended that I get out and walk everyday to help the grieving process. It did help. I could cry, talk to God and count my blessings. An inspiring story, thank you. I lost a child and when I went into my 10 day post op appointment I was told I had cervical cancer. I had to have an immediate hysterectomy. I lost my child and the ability to have children at the age of 27. My husband could not take the ongoing pain and left. Now at the age of 66 I look at this as a blessing. When I was 31 I met the most wonderful man and we have been married for 34 years. Childless , yes. The pain of losing a child and all children still lives with me but with the help of my family and friends I got through it. There is not a day that goes by that I don’t think of this terrible loss, but I also think of my darling man and all the love he gives me. Life goes on and we all suffer. Hopefully we can all look for something, even one small good thing each day. I am also a chronic pain patient. My physical pain is sometimes unbearable but I try to be good to myself by exercising. I’m 28, still single, and i have Rheumatoid Arthritis. The arthritis affecting my daily movement and I’m tired of getting sick. But your words truly changed the way i look on my life. “Do your best with what’s in front of you and leave the rest to the powers above you”. I see a brighter future of my life now. Wow, the student and Claire both describe a situation that is exactly what I am going through and this article is exactly what I need. I will remember and use the phrase and the story (love them) to keep perspective and positive. I love that your articles never sugar-coat but still remain positive with real ,practical counsel. Thank you! Thanks a lot for this wonderful piece. Honestly, what has really helped me is found in grandma’s words: “Doing the best with what’s in front of me and leaving the rest to the powers above me.” This mindset has really, really helped me in several challenging situations. Jehovah knows the best and our full reliance on him will always yield positive results. This is so true. I experienced a painful divorce after 26 years, then a job loss after 28 yrs, then a heart attack. I’ve no doubt that stress was a player in my heart attack. My ex and I always talked of retiring to a lake. After the divorce I wasn’t sure where my life was going and was depressed, and threw myself into my work. In hindsight, I should have sought therapy to recover. I volunteer as an advocate for the American Heart Assoc. I’m now 12 years post heart attack, living on the shore of a Great Lake, happier than I’ve ever been, and have always had the love and support of my sons. Still seeking my last love, but if it doesn’t happen, I’ve worked for a happy life, and I made it. I appreciate your articles. Sometimes there are new ideas, and others are those ‘been there’ moments. Absolutely heartfelt message!! I cried the whole way through. Your email newsletters and posts are so inspiring, reminding us of the life that is so open for us to live no matter the situation. I thank you for this message today. Stay blessed and continue your journey!! Thank you for sharing this. Reminds me of things that I’ve gone through and how I got to where I’m at today. In the morning I pray and thank The Good Lord for all of the blessings that he has provided me, my family and friends. I don’t worry about anything, I just put it in the hands of God. If you look around at your life and the things that you have been blessed with, you really don’t need anything , you have the love of your family and friends . Thank you. That’s just the truth… I’ve learnt each day to look at the little things I have, appreciate God for it and I found it difficult to think of my problems, heartache and difficulties. I learn to appreciate the more and by so doing, I see abundance and over-sufficiency in the little things around me that make me ignore my challenges. Thank you for your message today. I am struggling to come out of a 3 year depression caused by the loss of my wonderful husband and consequently my life. I have been seeing a Jungian therapist for a year and it has helped. However, the issue I still have is “dealing with what is in front of me”. I have developed an ability to not live in the now. Any suggestions for someone who has difficulty stepping back into the mundane everyday parts of life? I have multiple tools I use…today I am stuck in my depression. First I asked for help and surrendered to my helplessness. I use the tapping technique and rest…then I reached out and read my emails. This one and Cheryl Richardson’s both helped me today! It’s important to do “daily maintenance”. When I get up I take my medication. I have been making smoothies and adding dehydrated wheat grass and organic protein to give me energy. My dog helps me be laying with me and I get up when she needs to get out. Motivation does not come from within…it comes from Doing!!! I usually stArt a load of laundry to get going then I feed myself! I know that sometimes I have to withdraw and cut corners just to get through this day but tomorrow will be better after self care! I am going to a Peer Support Counseling Center which gives me s place where I belong! Thank you for sharing and hugs to all struggling. I too have know such pain especially recently-losing my Mom, Dad, becoming disabled and divorced. Some days I’m a mess but if you can realize there are always those less fortunate and “this too shall pass”- my favorite saying. It’s so hard to come to grips with what you thought your life would be is now not that at all. Do the best you can and trying helping others – that always makes me feel better!! I am struggling with multiple health issues that effect my energy and kicked in depression. I was feeling fearful for my relationship with my boyfriend. He even said he was going to stay away…This article reminded me that just by receiving this, I’ve reached out and also why I’m committed to my relationship. I trust him to be sensitive because he stronger due to the trails he has survived. I will be patient with myself today…and use this time to heal and recover in my waiting. My goal today is to get outside in the sunshine and appreciate nature for at least 40 minutes! I love you marc and and angel and everyone else in the marc and angel community! Thank you for your great support. I do strugle with my situation at this moment and your words are great help. For me going to the forest and being in the nature helps a lot. It brings serenity. That is the place,where I became humble again, place, where I find my inner peace. 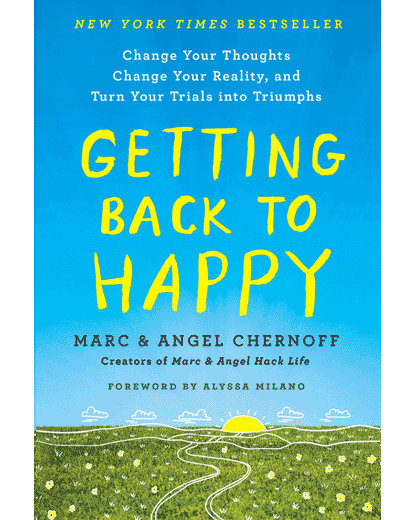 Marc and Angel brought light to me with their blog few times in past. Thank you for that ☺. My life has been very stressful, starting with marrying a abusive man. Then we lost a baby to cancer. We had two healthy children after that and I am very grateful for that. I divorced him when he started teaching the kids to be abusive to me. It took a few years, but the kids love me, now that they are old enough to look back and see that he was wrong. Then two sisters got breast cancer and died. A couple years later my brother died from a brain malformation. Then another sister got breast cancer. We contacted a geneticist and it was determined that my Dad had a mutated gene and that we each had a 50/50 chance of getting this terminal breast cancer. There were seven girls in my family, my brother was the youngest. The rest of us girls got a blood test and we did not get my Dad’s bad gene, which of course is a blessing to know. The one sister that is still living, with the cancer, is in a remission period. She has been good for several years, now, but it hangs over our heads that one day we are going to get the call that it has come back. I a grateful for every day that she is still good, but she has depression and is going through a divorce. I lost my job of 24 yrs, last Aug. due to the selling of the business, which was very sudden. I have not been able to find any job, any where. Twice I was facing eviction and twice a sister came through to lend me the money to catch up on my rent. I am waiting on her second check, now. She says that she cannot help me anymore, even tho she has loads of money. She married a wealthy man and they recently divorced. The fear of not being able to find a job is often overwhelming. I was diagnosed with severe anxiety and panic disorder in Sept. of 2008. Every day is a struggle, except when I am with my darling 22 month old granddaughter, or if I am camping, or with another family member that I dearly love. Nature IS a great comfort to me. I am training my dog (two yrs old, got her as a tiny pup) to be a therapy dog. I know that others are suffering way more than me. I have a special place in my heart for veterans with PTSD, now that I have an idea what it is like to have such a horrible illness. I am kind and never show my sadness around strangers. I have started talking about mental illness openly and on Facebook, too. It has taken awhile, but my FB friends are now getting used to it and comment about their problems and those who are mentally sound are empathetic. I do a mental illness walk in Chicago every year, this will be my 4th. The first year, I had a tough time raising $100. The next year, I raised my goal and made it. Last year, my goal was $500 and I hit it a week before the walk!! This year should be even better. When I first starting openly talking about mental illness, people were embarrassed and it was tough for me to do, but I have to do my part to “stomp out the stigma”. I didn’t mean to write a novel, my fingers just don’t know when to stop, sometimes…LOL. It DOES help to help others & I have finally grasped the concept of “mindfulness” ( one step at a time – live in the moment ) and give my worries to God. I can finally sleep well after many years of not being able to. I wake every morning with anxiety, but I have to keep on keeping on and the therapies I have learned DO help. I just need to find a job!!! Thanks for the great post and It’s come just in time! Cheers! MARC AND ANGEL’s email newsletters and blog posts always make me graceful and grateful. Thank you for saying these words. I can feel the real sincerity from your open letter, and I agree with everything said. Thank you so much for sharing that!!! I will reread that like reread all the others!!!! I also appreciate that I can call out to you in my desperate moments which are quite frequent!!!! Great Reply to a troubled woman. Would love to hear you speak in person, if you ever do come to India, especially Kolkata. I would be delighted to meet you. Your words have magical healing powers. God has given you this ability. You must utilize it for the benefit of mankind. Forget short term benefits. Look at the larger picture. Continue to help people! Thank you Marc and Angel. I really look forward to reading your posts everyday. You both write in such a way that is very soothing to me, easy to understand and gives me hope. You are two very special people and your words, posts help so many people. Thank you for this post, it was very inspirational! In my experience though, sometimes the solution will only become apparent after taking a step back from the situation. Taking a few months off, somewhere distant from the reach of emails and phone calls can often provide clarity. I desperately need a break from all the negativity being imposed upon me because if history is any indication, it will only keep getting worse. Someone also told me that the problem will follow me wherever I go and they are probably right but there is only one way to prove this to really be true. For me though, this might mean another country entirely and while I hate to leave my friends and family, I think I need to (even if it’s only temporary) in order to be able to put things in perspective. I woke up this morning after a whole day yesterday spent crying. It’s rare for me to do this because I have 3 children and I don’t want them to see me breakdown. However, yesterday they were away. I’ve been feeling extremely low recently. My husband of 16 years text me on Saturday and said we should get divorced. We’ve been separated for some time after he abruptly moved out last August. Around October, he expressed to my children (he refuses to speak to me) that he wanted to remarry and have more children. I felt so betrayed because he hadn’t even divorced me nor given any time to mourn the loss of our marriage. Needless to say, the way he ended everything (no closure) left me feeling tortured. I tried my best to make the best of a bad situation by trying to move forward every day. Yet, a deep sense of sadness pervaded me, and now I feel so worthless. I gave my all to this marriage- my heart and soul. My husband is a troubled soul who had a very difficult childhood. At times, maintaining my compassion and values was so hard because he did treat me unjustly over the last 8 years on many occasions. However, he also had a wonderful side to him and that’s the part I held on to. And that’s the side I’ll remember. I don’t want to hold on to the sad or bitter memories. This is how I found myself crying yesterday. I looked at his photos and those of us together during happier times. I allowed myself to remember funny moments, heartfelt moments and beautiful moments. I remembered him being constantly by my side during a long labour with our first child. I remembered moments we laughed so much we cried. You can’t erase 16 years of marriage. I’m struggling now…struggling over the losss of someone I love so much. It hurts so much as I’m sure many of you will relate to. The last few days I’ve had this thought that life is meaningless and I’ve been fighting it because I’m scared where it may lead me. I’m in a really dark place right now. I go outside and put a smile on my face. I cope by going through the motions everyday. I’m a teacher and a single mother to 3 children so life is pretty exhausting at the best of times. My faith and inner strength has always helped me pull through during turbulent times, but nothing is helping. I’m tired of putting on a brave face. All I want to do is sit in a corner and cry. So this morning, even though it’s light outside I woke up in a dark world. I reached for my phone and decided to read Marcandangel (often used to turn to your site over the years when times were tough). I read this article. It felt like some light reached me. I’m not sure how long it will last. I’m grateful for it. Reading all the comments and seeing others going through tough times makes me feel like I’m not alone. I just hope I find a way out of this darkness. People say time heals. It’s been months since he left and it seems to be getting worse. Thank you Marc and Angel. I’d appreciate anyone telling me advising me how to stop being in pain. The quote at the beginning of this article inspired me. “Be soft. Do not let the world make you hard. Do not let the pain make you hate. Do not let the bitterness steals your sweetness”. This gives me an insight that no matter the situation we find ourself in, we should not let it steal our happiness. The short story of the fisherman should be a lesson to all of us that some things do happen for some reasons. In any circumstances, always do your best with what in front of you and leave the rest to the powers above you. God bless you, Marc and Angel. I am just grateful to find your website. A lot of people talked about how they went through those tough days and shared their ways here which make me, one of the readers, feel so warmed, touched and blessed. Despite of the hardest moment in our life, we are, kinds like, continously struggling between bad days and good days, between upset and happy, between things you want to do and things you have to do, between lonely and noise… One thing you need to know, for all, is just take it. Take what life gives you. Say to life, okay, you gives me this, I take it. I handle it. I feel the pain. I feel the sweet. I take it all. Thank you. Thanks for this article. I have always had a difficult time sympathizing with others. However after reading your encouragements I have been able to sympathize with people who are struggling with their lives! I am only a small human being trying to understand the world I live in. I have never felt more selfish after reading your comments. Now, I hope to encourage others through their suffering. I agree with the fisherman story, you never know what’s going to happen next. But like you said, we must go with the flow. I think suffering unites us in a very special way. There is love that binds us together. That is my personal opinion.